Brewery Steðji's whale beer, Hvalur 2, has stirred up anger from many international animal rights societies. The beer, which is made using whale testicles will hit Icelandic stores on January 23rd. An article in USA Today cites The Whale and Dolphin Society who say that the use of whale meat in food products is unethical and obscene. According to The Whale and Dolphin Society the fin whale is in danger of extinction. 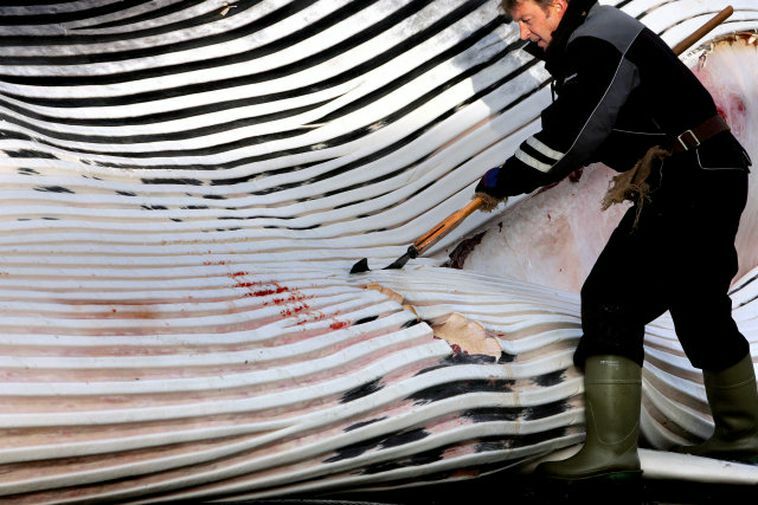 However, under current regulations Icelanders are allowed to hunt 154 fin whales per summer. "Right-minded people would no sooner drink beer brewed with whale testicles than they would order similar drinks made with tiger, elephant or rhino testicles and our hope, of course, is that visitors to Iceland - a truly beautiful country with lively, friendly people - will treat this latest offering with the disdain it deserves," it says in the statement from the society. The Guardian interviewed brewer Dagbjartur Aílíusson who said as a response to the criticism, “We live in a country that allows whaling and the whaling is very well controlled by the Icelandic authorities, but fisheries here are self sustainable and very responsible." Gísli Víkingsson, whale specialist at the Marine Research institute explains that Red Lists of animals in danger of extinction such as The IUCN list of threatened species look at the fin whale as one population of whales on a global scale. "Their list is governed by the situation of the fin whale population in the southern hemisphere which is in very bad shape. It was a very big population before the time of whaling. However, the population of fin whale in the central North Atlantic is around 20,000 which is the same number as before whaling started." Vík­ings­son ex­plains that fin whales be­long to var­i­ous independent populations around the world and their pop­u­la­tion sit­u­a­tions are very dif­fer­ent and Southern Hemisphere fin whale even belong to a different sub-species. He adds that ac­tu­ally, else­where on their web­site The IUCN ad­mit that the fin whale pop­u­la­tion in the North At­lantic is in abun­dance and that the rea­son fin whales are on the threat­ened species list is be­cause of the pop­u­la­tion in the south­ern hemi­sphere. Thus, on the European IUCN Redlist covering the North Atlantic fin whales are not classified under any of the threatened categories. The cur­rent quota for the num­ber of fin whales hunted in Ice­land are 154 per year but ac­cord­ing to Vík­ings­son, this num­ber has not been reached in re­cent years.